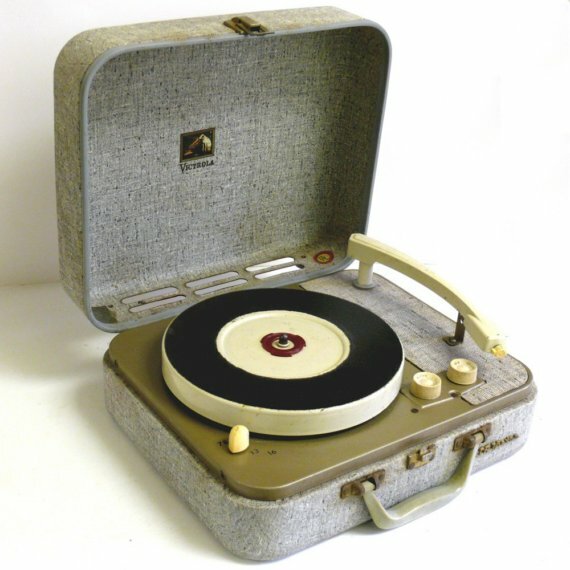 The gray suitcase record player that my uncle and my new aunt gave me for my birthday came with a 45 RPM record with Yellow Submarine on Side A and Eleanor Rigby on Side B. I played Yellow Submarine over and over, dancing and spinning and dizzying myself into black star-flecked space. “We all live in a yellow submarine.” But I also lived at 1735 Asylum Avenue in West Hartford, Connecticut, where my much older father had altogether different and old-fashioned taste in music. Dad cued up Gilbert & Sullivan operettas, Straus waltzes and John Philip Sousa marches on the gleaming hi-fi console in the living room. On random Sundays, particularly in the summer, he marched my brother and sister and me around the house to the rhythm of Sousa’s brassy, piccolo-inflected music. Over the blare of tubas and trumpets, my father conducted us as we waved small American flags. Dad, the standard bearer of our patriotism, carried a large flag with only forty-eight stars. Dad kept the car radio in the ’65 aquamarine Chevy Malibu tuned to WRCH, the station that claimed to play “rich music.” Neither classical nor popular, WRCH broadcast the cascading string music of Ray Coniff and Henry Mancini. Pop music occasionally poked through my father’s repertoire. He bought me 45 RPMs of “The Ballad of the Green Beret” and “Winchester Cathedral.” I listened to the former with the reverence of taking in a prayer that I didn’t quite understand. The latter was a goofy vaudevillian tune with sliding whistles and muted trumpets. My young Cuban mother sang Guantanamera, the de facto anthem of Cuban ex-pats the world over, morning, noon and night. Before I discovered the Beatles, the Cuban crooner Beny Moré was the closest I came to dancing to rock ‘n’ roll. On cold Connecticut afternoons, my mother played Beny’s music. “Soy Guajiro,” Beny sang. I was a peasant too. I mixed uneasily with my father’s refined second generation Jewish-American family. In those days my homesick mother danced in place as if she were afraid to move even further away from Havana. The pleated gold Ed Sullivan Show-style curtains gave our beige and brown living room theatricality. I pretended to be the lead singer of Beny’s orchestra. I also imagined the Beatles one and only Hartford performance, taking place at 1735 Asylum. The Fab Four would sing a rendition of “Love Me Do” that would harmonize with the audience’s teenage screeching. The Beatles, though, were mine alone. These days I shade my eyes and look into the distance from my almost empty nest, remembering not only the “firsts” my children did, but also the last moments of actively parenting kids who were once wholly dependent on me. As I write this on a snowy Wednesday, I go back to the moments when snow days guaranteed me snuggling time with my Anna and Adam. They’d flop into my bed and I would luxuriate in how small they were – small enough so that three of us had room to spare in my king-size bed. Adam is a young man and Anna is away in college. The empty bed feels gigantic. Time blurs from the first time Adam and Anna tentatively rode away on bicycles to the first time they sat behind the wheel of a car. It whips by from the time I could carry my kids to the moment that Adam gives me his arm so I don’t slip on the ice. Adam’s childhood effectively ended for me the first time he wrested a shovel from my hand and cleaned up the walk in half the time I could have done it. It dawned on me that my son was physically stronger than I was as I watched him heave piles of wet snow so effortlessly. My son shaves his face. My daughter catches a ride back to school with someone I don’t know. Adam navigates his way downtown on the T. Anna calls the doctor to refill her prescription. These were things that I used to do for them. When that first tooth fell out, I played the tooth fairy and slipped a dollar bill under their pillows when I was sure they were deeply asleep. I miss tucking them in at night. I miss reading to them. What was the last book I read to them? What was the first “grownup” book they read to lull themselves to sleep? Once, I knew everything about my children – from their sleep habits to their favorite foods. Now I stand on the periphery watching them change and grapple with adulthood. I’ve witnessed Anna’s heart break. In these last years Adam has shot up 11 inches straight into manhood. My children are building their own identities; I hope Ken and I gave them a solid foundation. Which brings me to Adam. A couple of months ago, I was reading the paper on a Saturday morning, debating whether I should go to synagogue or catch an early movie. Adam was up uncharacteristically early. He always sleeps through a weekend morning. But I could tell there was something on his mind. That particular day, Ken slept uncharacteristically late. It was just my boy and me, and I noted his strong jaw line, the soft stubble on his face. I saw so much of Ken and me in him. He was on his way to becoming the gentlest of men, just like his father. Ken finally came downstairs. Adam suddenly stood in front of us and said he needed to say something. He shifted his weight from one foot to the other. “What is it, buddy?” Ken asked. “I’m gay,” said my son. “And we adore you,” I replied. My children know that there is nothing that they can say or do that will make me stop loving them. My children also know that claiming their identities is a cause for celebration in our house. Just last summer, Ken’s brother Glen married his longtime partner Roger in a beautiful ceremony on a perfect summer evening. His wedding picture takes its place on my mother-in-law’s shelf among the photographs of his two brothers and their brides. I learned a lot from my in-laws about having a gay child. When Glen came out, they immediately found support at PFLAG (Parents and Friends of Lesbians and Gays). PFLAG was founded in 1972 by a mother who simply wanted to support her gay son publicly. My in-laws quickly found their footing at PFLAG meetings and were dismayed at the stories they heard from gay children rejected because of who they were. It demonstrates how far we have come as a society that Ken and I feel we don’t need a rudimentary education in having a gay child. Adam is one of the only boys in his all-male school that is out and his friends and teachers have been notably supportive of him. His rabbis have told him how beloved he is at temple and how they support his choice to love whom he wishes. “Sunrise, sunset, swiftly fly the years … I don’t remember growing older; when did they?” goes the old song. God willing, my daughter will make a life with a man she loves and so will my son. And each day that they mature, I love them more than ever.